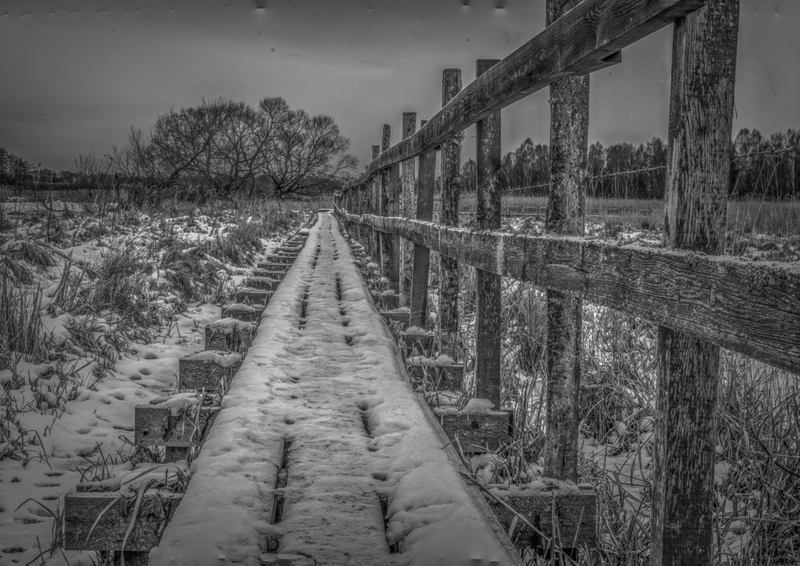 March 2019 BW, a view at path over Dyarna, a swampy area south of city Enkoeping (Enkoping) Sweden, a winter day 2019 in black and white. The pathway is covered with white snow, beside the boardwalk old yellowed grass from last year is seen. The image is taken from a low level like a very little child would see the world. We should sometimes think what the world is like in other peoples view. Collage , 9" x 12.5"
Many of my collages are inspired by words. 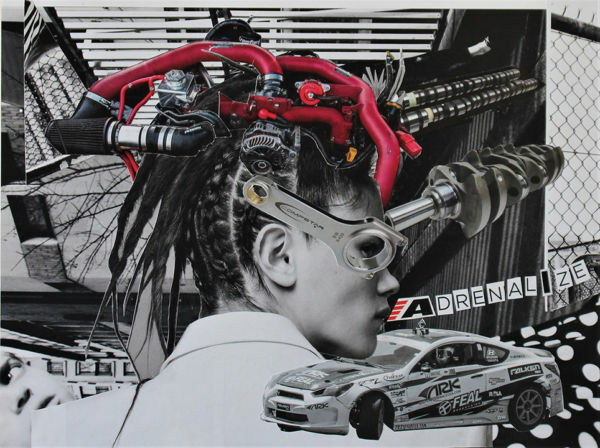 Adrenalize immediately made a connection with my love of cars, especially fast cars. This work is all about the feeling you get when you are ready for action, ready to achieve your goals. Super charge your brain and get to work! Degree in Textiles and Clothing with a minor in art from Arizona State University, classes including painting, pottery, drawing, photography. Showing online and in galleries in Israel and USA since 2015, more than 25 shows in all. 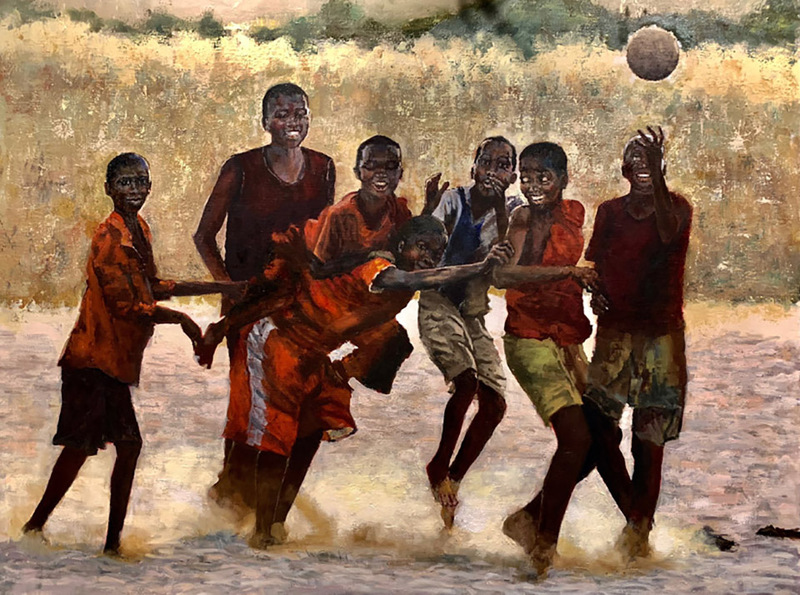 Oil , 36" x 48"
Zimbabwe depicts a group of young boys at play, a moment in time of pure joy. Painted in oil on canvas, being backlit, the challenge was to define, except for minimal rim light, facial expression, anatomy, form, gesture and drapery, all in dark shadow. Joe Grenn is a native of New Bedford, Massachusetts, received his education in Boston and concluding as a Harvard postdoctoral fellow. He moved to Marin County, just over the Golden Gate Bridge from San Francisco, in1972 and retired in June of 2015. Joe maintained a private practice in endodontics in San Francisco, lectured internationally and was a clinical professor at the University of California School of Dentistry form 1972 until his retirement. He has since dedicated his time to his long time love of oil painting, which started with “painting by the numbers” at age seven. Joe maintains a studio at 39 Liberty Ship Way on the Liberty Ship Dock in Sausalito and is a board member of the Marin Society of Artists. His paintings include landscapes, portraits and figures, all of which he hopes evoke a special place in time. Joe’s web site is joegrenn.com, where his artwork and past issues of his newsletter, Joe Grenn’s Wonderful World of Art, can be viewed. New subscribers are welcome and can opt in on the home page by entering their e-mail address. 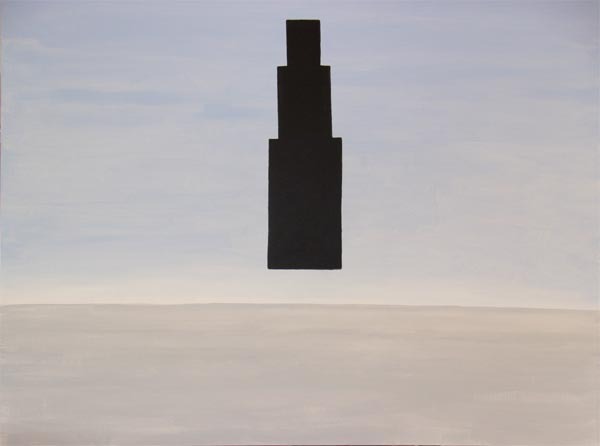 Acrylic on Canvas , 30" x 40"
If you look at the black bar, it will lead you into an unknown world. Born and grew up in China. 1995, came into America, work as a computer Engineer/Programmer. 2006, went to West Los Angeles College to learn Oil Painting. 2011, published a collection of his paintings – “Spirit”. 2014, Show his artworks in Las Vegas. 2018, Show on New York ArtExpo. 2018, Light Space Time, Special Recognition winner. free atmosphere, and a space of imagination. details, but have characters. Each of his painting is different with others. you take things from – it’s where you take them to. oil , 20" x 24"
Thomas Buchs is an an illustrator and painter. As an Illustrator, Thomas has created artwork for advertising for many national, regional and local companies during the last 46 years. 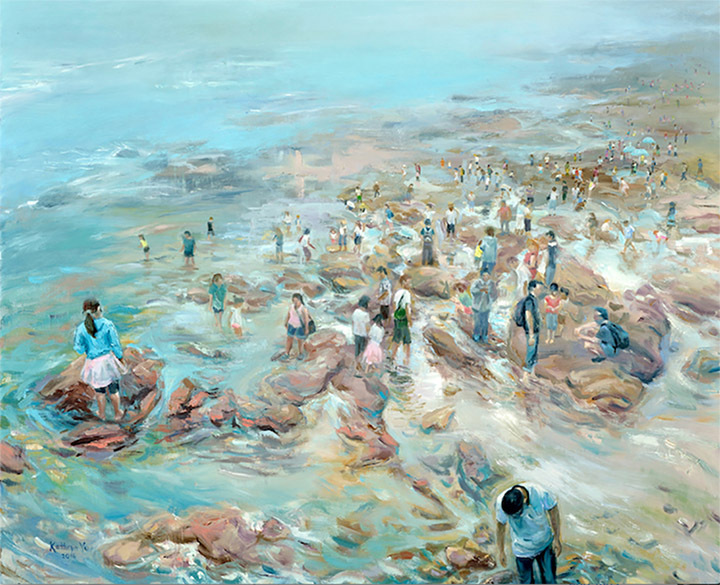 Much of his current work is Plein Air Painting (painting from life outdoors). Buchs has won dozens of awards in Plein Air Painting competitions. I don’t paint many still life paintings, but when I do I try to inspirit them with some symbolism like the masters of the past did before. 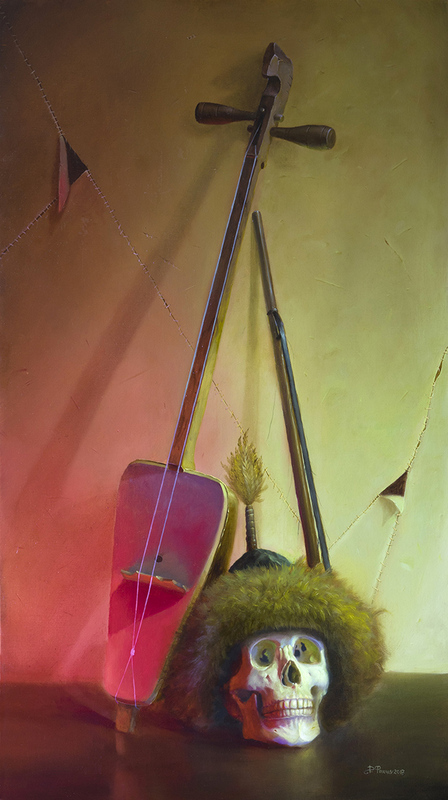 “Music of War” is the painting about life and death. On the left side of the composition you can notice a two-string musical instrument called “Topshur”. It takes its origin from the Western Mongolian tribes. Mongolian people usually sang songs about wars and heroes of the past accompanied by this instrument. They also played topshur before a battle to inspire people. Somehow this instrument symbolizes a war. But the same time music can symbolize life, movement, inspiration. On the right side of the composition you can see the human skull in old style Mongolian hat. Apparently, it symbolizes death, “Memento mori”. I decided to paint two light sources. Left one is red. A color of life, fierce and energy. Topshur is being lit by this light. Right light source is green. In color psychology green color stimulates harmony in the brain. It is a calm color. All of us will find desired peace after death. Also, painting this still life I was inspired by 19th century Russian artist Vasily Vereshchagin. One of his most famous paintings is “The Apotheosis of War”. He has painted a big pile of sculls in a middle of Central Asian steppe. Inspiration came to me from the inscription on the frame of this large painting: “Dedicated to all conquerors of the past, present and future”. Also, when I paint still life paintings, I usually use an old multilayer technique (like Flemish, a little bit modified). It takes a lot of time to finish a piece with such technique. 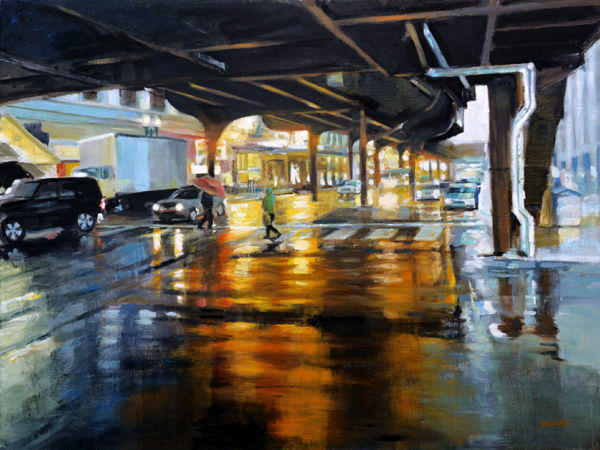 Paintings made this way have volumetric light, the illusion of volume and presence is incredible. The light pierces the canvas and reflects from the wall where the painting is hanging and lightens the canvas from inside. As the shadow areas have the most transparent layer it glows the most. You can notice this effect on many masterpieces of 17th-18th century. Dmitry Fesechko (b. 1988) is an artist from Moscow, Russia. He started his artist career as an abstract painter, then for some years was absorbed in surrealism and symbolism, taking part in exhibitions in Russia and the EU. He also worked as a digital illustrator for some time but abandoned it focusing entirely on traditional oil painting. He has studied classical multilayer technique that takes its origin from old masters of the past. Nowadays Dmitry works in genres closer to life like still life, landscapes and paints a series of paintings inspired by several trips to India. 2011-2013 Participant of Andrey Nekrasov surrealism art projects “Geysers of subconscious” and “Ying Yang”. Oil paint on canvas , 20" x 24"
As a shy and private person, the pieces I create often share in my quietness. Even a beach teaming with people, when filtered through my eyes and hands, can nevertheless come out with a quiet mood to it. The title “We’ve Drifted” will mean different things to different viewers. Perhaps the people populating the image have all, as a group, drifted to this dreamlike location, removed from their normal everyday lives. Or, drifted may refer to how close in proximity the figures all are and yet there is a feeling of distance in that there is very little interaction between them. For others, the focus may be on the male figure and the female figure who are in the foreground. They seem as if they could have arrived together, but in keeping their heads down, each preoccupied with their own searches, their paths split and they drifted unknowingly farther and farther apart. Kathryn Yu was born in Dongying, China, but has resided in the United States from the age of 5. She received a bachelor’s degree in fine arts from the University of Texas at Austin and went on to teach after-school art classes to over 400 youth in the Austin area throughout the years. While her very favorite medium to work with is oil paint, she loves to dabble in a variety of art styles and materials, even taking on a massive ongoing project of producing personalized Copic marker avatars for all of the monks who train in kung fu at the Shaolin Temple in China, the site where kung fu originated. My wife is a people watcher. We live in a small town in eastern Washington where most of the people are “normal”. On a recent visit to San Francisco we stopped at a wharf-side shop for a beer and sandwich. As I sipped my beer, I kept my camera poised for that one interesting shot that was sure to come. I noticed my wife was intently watching the cast of “not-so-normal” characters that surrounded us. She was so totally mesmerized by their actions that she had no idea that I had just taken her picture. I was so intent on taking her picture that I ignored all the “not-so-normals” in the background. It looks as if I made the right choice. Gaylord Mink began his “artistic” life as a photographer when he retired after 40 years as a research scientist. He began this afterlife as a free-lance wildlife videographer where he concentrated on the movement and behavior of the wild subjects. Later he expanded to digital still photography where he now attempts to tell visual stories about the subject’s behavior. Recently he is focusing on incorporating light and texture as principle subjects in his work, most of which still centers around wildlife and natural things. Occasionally, however, he attempts surreptitious portraits such as this one. 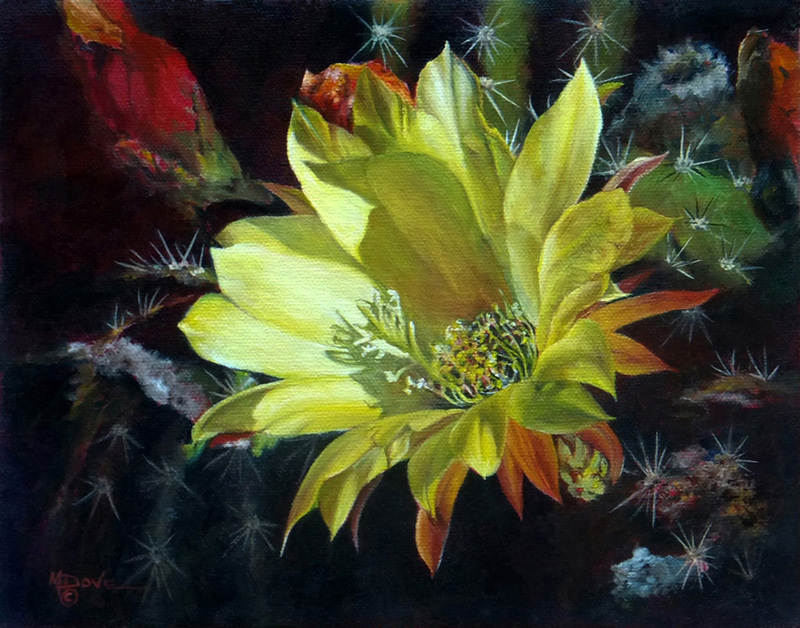 "Sedona Arizona Yellow Argentine Giant Cactus Flower"
Oil painting on stretched canvas , 8" x 10"
The Argentine Giant Cactus Flower is a favorite of landscapers in the high Arizona desert. This fragrant blooms normally open at night and persist until early to mid-morning. While it is said to be a nocturnal blooming cactus on cool, cloudy days in Arizona; the flowers continue blooming during the day. The cactus of choice in the neighborhood. This Yellow Giant was in my neighbor’s yard backlit by the early morning sun when I took the photograph. Oil paintings were added to expand the level of painting communication. Most often the subject matter directs how it would like to be interpreted in watercolor, oil pastels or as an oil painting. The subject intensity of the flower color and shadows were best expressed in an oil painting. Growing up in Houston, Texas, Mary Dove’s father made certain she was exposed early and often to a wide variety of life experiences. These included all manner of wildlife, birds, nature, sports and even food. Such invaluable encounters have enabled her to breathe life and soul into everything she chooses to paint or draw. Diversification thus became, and remains today, the hallmark of her work. Paintings range from landscapes and architectural structures, big game animals, pet portraits and still life. This allows the subject matter to emotionally fine her as she responds to a particular location or personal experience. A resident of Sedona AZ, Mary Dove earned both a Bachelor and a Master of Art Education Degree from Texas Tech University, Lubbock TX. Her college education began as an architect major, moved through commercial art and technical illustration to discover her artistic voice as an illustrator. She now captures structures vanishing from our ever-changing landscapes. In the animal world, her keen insight and sensitivity express the physical characteristics and personality of our animal companions and wildlife. Her chosen subjects are depicted in a “realistic expressionism” style reflecting the study of light and values to depict the story mood of the painting. 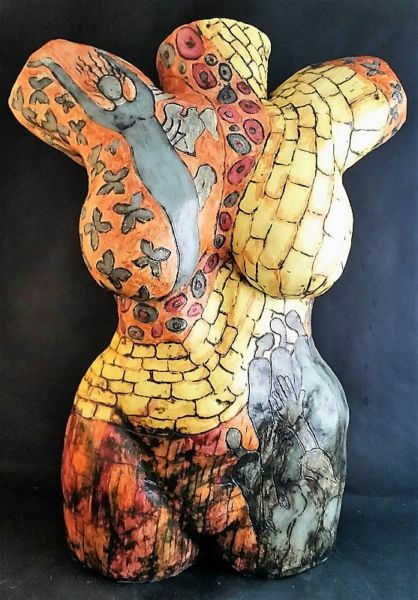 "Beyond the Yellow Brick Road"
Clay, solid built, finished with terra sigillata and Mason stains , 20" x 15"
My primary focus when sculpting is the female human spirt that comes from being raised in a family of strong women. Often, I like to convey a message or tell a story through my sculpture. “Beyond the Yellow Brick Road” as we know it from the book and movie, The Wizard of Oz, is referred to as a spiritual allegory. By searching for answers in life, as you travel the yellow brick road and then reach the end of the road, you come to realize the answers are inside you and you have the power to control your own destiny through your God given talents. “Beyond the Yellow Brick Road” was coil built with Max White paper clay; the story was drawn and incised on the surface, and when the clay was bone dry, terra sigillata was applied with Mason stains. After bisque firing, copper oxide wash was applied and wiped off, then the sculpture was fired a second time. The color was enhanced by the application of a matte sealer. When Katty Smith grew up in the small rural southern town of Halifax, Virginia, art was not a topic of discussion among the less than one thousand residents. The opportunities to express any artistic ability were somewhat limited to coloring books and drawing scenes on the chalkboard. None the less, having a very large closely knit extended family, highlighted by frequent memorable gatherings, and knowing most people in the town made the formative years a wonderful experience. A year and a half at The Woman’s College of the University of North Carolina at Greensboro was put on hold when Katty married her high school sweetheart. Ten years later with two children on board, she began her journey to a B.S. degree from The University of North Carolina at Greensboro and eventually earned an MBA from the University of Toledo at age fifty-nine. Anytime there was an opportunity to go to school, Katty was right there ready to enroll. In 2008, at age sixty-five, Katty enrolled at Armstrong Atlantic State University, Savannah, GA, in a ceramic sculpting class. The first day of class when she received her chunk of clay, her lifetime search ended and her passionate journey began. 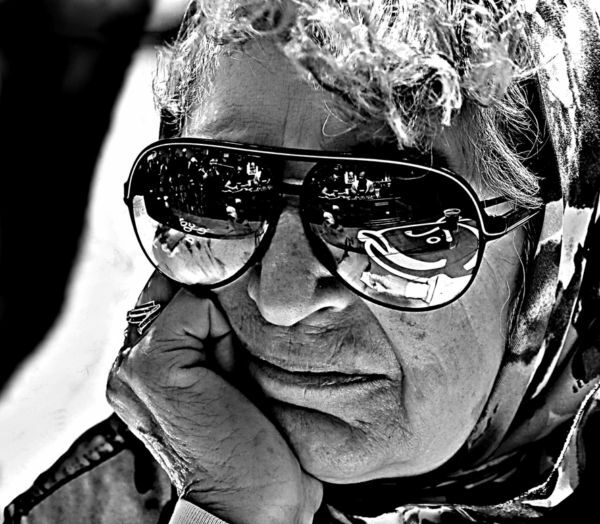 Never once in her sixty-five years of life had Katty ever dreamed of being an artist. After moving to Florida in 2010, Katty enrolled at Crealde School of Art in Winter Park, FL, for three years of ceramic sculpting classes. The purchase of a house with a large garage and a new kiln allowed Katty to become a studio artist in New Smyrna Beach, FL, in 2013. Now in her spare time, she plays tennis and volunteers locally at The Hub Gallery on Canal, at the Artists’ Workshop, Inc., and teaches occasional sculpting workshops. She belongs to art associations that offer exhibiting opportunities and has won numerous awards to include four best in show awards. Katty currently exhibits her work at The Hub on Canal in New Smyrna Beach.